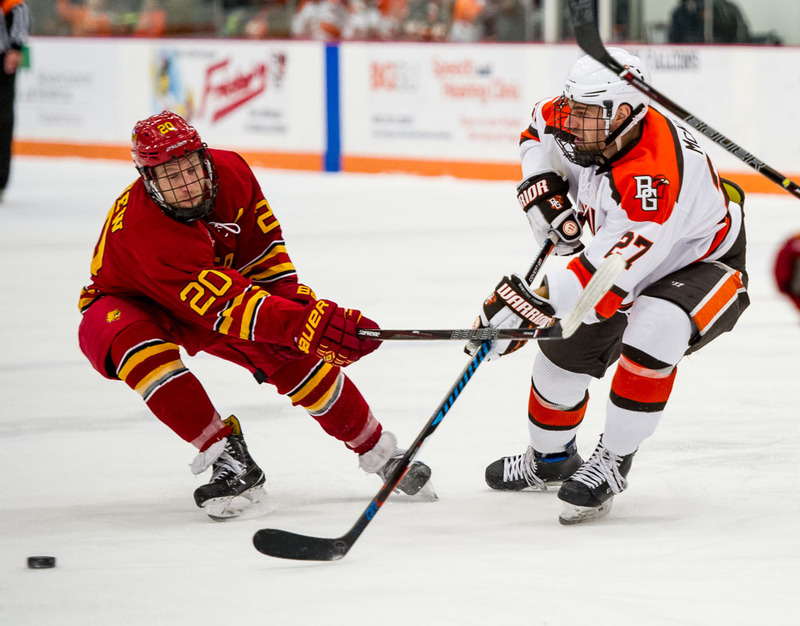 Bowling Green's Joe McKeown (27) passes the puck against Ferris State's Gerald Mayhew during Friday's game (Photo by Todd Pavlack/BGSUHockey.com). Bowling Green was impressive Friday night. The Falcons played well offensively and defensively, and Chris Nell was sharp again in goal en route to a 6-1 victory over Ferris State. Ten Falcons had at least one point in the game, including Matt Pohlkamp with two goals and two assists, and Sean Walker with a goal and two assists. Stephen Baylis, Lukas Craggs and Alec Rauhauser had the Falcon goals. Nell made 27 saves, 15 in the third period when the Falcons already held a 6-1 lead in Game 1 of the Western Collegiate Hockey Association quarterfinal series. The Falcons, who improved to 18-17-2 overall, can clinch the best-of-3 series with a victory Saturday. But a win by Ferris (13-18-5) forces a third and deciding game Sunday. Faceoff is 7:07 p.m. The BG-Ferris series was expected to be a close, hard-fought, tight-checking one, but the Falcons turned Game 1 into a rout. They’ve won four straight games, playing well overall in each of those contests. FAST START: The Falcons built a 2-0 lead in the first period, thanks to goals from Pohlkamp at 6:46 and Baylis at 9:15. The Falcons didn’t have a shot on goal until Pohlkamp scored on the rebound of Tyler Spezia’s point shot, although Pierre-Luc Mercier rang a shot of the crossbar earlier in the game. Ferris had five shots at that point. Baylis doubled the lead when he fired the puck into an empty net after the puck caromed to him off the boards behind het. “To have those two goals go in, you could feel the momentum be on our side,” Bergeron said. CLOSE CALL: BG then let Ferris back in the game with two penalties — Joe McKeown was penalized for boarding at 10:04 and Baylis received major and game-misconduct penalties for checking from behind at 12:30. Baylis’ penalty gave Ferris a two-man advantage for 54 seconds, but the Bulldogs needed just 17 seconds to close within 2-1. The Falcons, however, killed off the final 4:43 of Baylis’ penalty to retain the lead. BG also held Ferris scoreless on Connor McDonald’s tripping penalty with 3:24 to go in the period. Killing off the remainder of Baylis’ penalty enabled BG to regain the momentum. “After we killed off the rest of that, we were still feeling good, even though we gave up that one,” Pohlkamp said. The Falcon penalty-killing was good as it allowed just the one goal in six attempts. Ferris’ goal ended BG’s streak of 23 straight penalty-kills without allowing a goal. SECOND PERIOD: The Falcons put the game away with a dominant second period when they scored four goals. They held an 18-3 edge in shots on goal and a 32-5 edge in total shots attempted. The first three goals came in a span of 2:51, starting with Pohlkamp’s goal at 2:58. Walker made it 4-1 at 3:50, while Rauhauser gave the Falcons a four-goal lead at 5:49. Craggs’ goal came at 5:49. The period easily was one of the Falcons’ best of the season, especially since it was against a quality opponent during the playoffs. “We were hustling a lot more to those pucks, winning battles, creating scoring chances,” Pohlkamp said. The Falcons finished the game with a 33-28 advantage in shots on goal, including a 27-13 margin during the first two periods. Despite the dominance, BG only had twopower-play attempts in the game. The second came late in the third period. BAYLIS: The game-misconduct penalty was Baylis’ third of the season, meaning he’s automatically suspended for Game 2 of the series under NCAA rules. The sophomore forward is one of BG’s best players and skates on the power-play and penalty-killing unit. BG played the final 47:30 with just 10 forwards since they dressed 11 forwards and seven defensemen for the game. Baylis’ goal was just his third of the season and the first since Dec. 9 against Michigan Tech. He’s had just five assists in those 17 games since. Baylis had nine goals and 13 assists in 35 games as a freshman last season. PENALTIES: McKeown’s penalty could have been a major, too, for hitting from behind. Although the Falcons haven’t been a highly-penalized team most of the season, they were coming off a 12-penalty game last Saturday against Alabama-Huntsville. GOALTENDING: Nell and the Falcons were bidding for their fourth straight shutout, but Jared VanWormer’s power-play goal snapped the scoreless streak at a school record 220:18. Nell broke the record of 154:43 last Saturday in a 2-0 win over UAH. 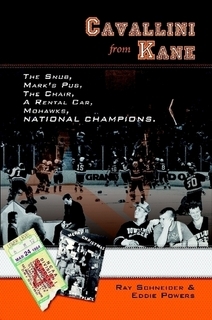 Brian Stankiewicz set the previous record during the 1977-78 season. The junior has allowed two or fewer goals in his last six starts. GOALTENDING II: Ferris goalie Justin Kapelmaster entered the game as the league leader in goals-against average and save percentage, but he lasted just 9:52 against the Falcons. The freshman was replaced 37 seconds after Baylis scored for the 2-0 lead. Kapelmaster then returned for the third period, stopping all six shots in he faced. Sophomore Darren Smith stopped 18 of 22 shots in 30:06. Kapelmaster still ranks sixth nationally with a .930 save percentage. He was 2-1 against BG in three games during the regular season, posting a 1.33 goals-against and a .951 save percentage. FOUR IN A ROW: Spezia has a point in four straight games. The junior forward has two goals and three assists in that span. FERRIS: The Bulldogs had an uncharacteristically off night, although they did play well in the third period. Ferris is the defending WCHA playoff champion after winning as the fourth seed last season. This season, Ferris finished fifth in the league two points behind fourth-place BG. The Falcons and Ferris split their two regular-season series, in November in BG and in January in Big Rapids, Michigan. PERSONNEL: BG forwards Matt Meier (upper-body injury) and Casey Linkenheld (lower-body injury) didn’t play Friday. Ferris freshman defenseman Cameron Clarke returned the lineup after sitting out last Saturday’s regular-season finale because of an illness. He was a fifth-round draft pick of the NHL’s Boston Bruins in June. Clarke was one of three first-year blueliners in the lineup for Ferris. FAST STARTS: The Falcons have never trailed in their last four games, and have held the lead after the first period in the last three. Prior to last weekend’s series against UAH, BG hadn’t scored in the first period of its last five home games and seven straight games overall. REVIEW: The Falcons played a three-game quarterfinal series last season, winning the final two games at home against Bemidji State. FIRST ROUND: BG is looking to become the only NCAA Division I team to win seven straight first-round series. HISTORY: The Falcons and Minnesota State are the only schools in the new WCHA to host a first-round series in all four years of the revamped league. BG and Ferris are the only schools to play in every WCHA Final Five during the last three seasons. HOLDING SERVE: The top three seeds in the WCHA all won Friday at home. Top-seeded Bemidji State, No. 2 Michigan Tech and No. 3 Minnesota State can all end their series by winning at home again Saturday.